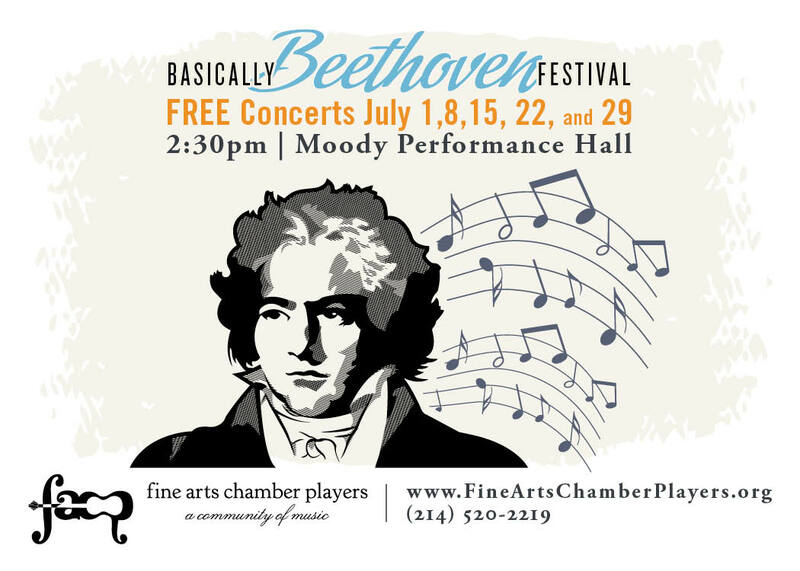 We are thrilled to present the FREE 38th annual Basically Beethoven Festival on Sunday afternoons in July. For 2018, FACP will produce FIVE FREE CONCERTS. Held in the Dallas Arts District at Moody Performance Hall (formerly Dallas City Performance Hall), every program starts with a Rising Star Recital at 2:30 pm followed by a Feature Performance at 3 pm. Rising Star Recitals present local, gifted young musicians; Feature Performances showcase professional musicians from the area. All concerts are FREE TO THE PUBLIC. Paid parking is available in surface lots and garages in the Dallas Arts District. Families with children are welcome. “For 2018, I wanted to highlight masterpieces from the past and the present across a variety of instrumentations and settings,” explains Basically Beethoven Festival Director Dr. Alex McDonald. Indeed, that has been accomplished with the five concerts anchored by a string quartet on July 1, a flute trio on July 8, pianos and percussion on July 15, a horn ensemble on July 22, and an operatic bass closing the Festival on July 29. Rising Star Recital: Student musician Josephine Chiu, piano, will be joined on stage by the professional musicians of the afternoon’s Feature Performance (below) and Scott Sheffler, bass. They will perform a chamber arrangement of Beethoven’s Piano Concerto No. 5. Feature Performance: Florence Wang, violin; Sean Riley, violin; Rachel McDonald, viola; Joseph Kuipers, cello, come together to perform works by Dvorak, Ravel, Haydn, Beethoven and local composer Quinn Mason. Mason was raised in Dallas, is a Dallas ISD graduate, and a former FACP scholarship student. He has won numerous awards for his compositions, and he was a recipient of the Rogene Russell Scholarship Fund in its inaugural year. Rising Star Recital: Shiv Yajnik is recognized for his accomplishments as a pianist and as a composer during this Rising Star Recital. He will perform Liszt’s “St. Francis walking on the Waves,” and his own piano trio, “Ondine.” For his comopsition, he will be joined onstage by professional musicians Jen Chang Betz, violin, and Joseph Kuipers, cello. Feature Performance: A piano trio composed of Shauna Thompson, flute; Deborah Brooks, cello; and Shields-Collins Bray, piano, will present Martinů‘s Trio for flute, cello and piano; and selections of Haydn‘s Piano Trio in G Major. Ms. Thompson and Mr. Bray will partner on local composer Martin Blessinger‘s pieces “Diversion I” and “Escapes.” They will also perform Chant de Linos by Jolivet. The afternoon also includes Ms. Brooks and Mr. Bray performing Beethoven‘s Cello Sonata No. 1 in F Major. Rising Star Recital: Matthew Ho, violin, and Claire Chiang, piano, will perform works by Beethoven, Ravel, and more. Feature Performance: Catharine Lysinger, piano, and Alex McDonald, piano, present Rachmaninoff’s Suite No. 2 for Two Pianos. They will be joined by percussionists Dan Florio and Brian Jones on Bartok’s Sonata for Two Pianos and Percussion. Rising Star Recital: William Sprinkle, oboe, and Eduardo Rojas, piano, will perform the second movement (“Largo”) from Beethoven’s Oboe Concerto, Hess 12; and his “Adelaïde”, op. 46. Feature Performance: French horn ensemble Four Hornsmen of the Apocalypse have captivated audiences with their musicianship and joviality. Members include local musician Gerry Wood, with Paul Blackstone, Brian Brown, and Audrey Good. The ensemble will present opera transcriptions. Feature Performance: Operatic bass Jared Schwartz with The Dallas Opera’s Music Director of Education Mary Dibbern, piano, performs an afternoon of art song, including works by Flégier, Fauré, and Liszt. The Basically Beethoven Festival is made possible in part by VisitDallas, City of Dallas Office of Cultural Affairs, TACA, Texas Commission on the Arts, WFAA Channel 8, DART, Dallas Arts District Foundation, and ExxonMobil Community Summer Jobs Program. 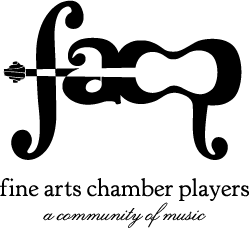 Since 1981, FACP has presented free classical music programs open to the public. In addition to the Basically Beethoven Festival, FACP presents free, monthly Bancroft Family Concerts October through May at the Dallas Museum of Art. Since its inception, FACP has served over 225,000 children and performed for over a half-million residents of North Texas.